Old Dublin society talk Pearse St Library at 7.30. pm on Wed 21st Nov 2007. The sinking of the Rochdale and the Prince of Wales. From the time of the French revolution in 1789 to Waterloo in 1815 there was nearly constant war between Britain and France. The battle of Trafalgar occurred in 1805. This coincided with the third coalition against France allying Britain with Austria, Russia & Sweden. After Trafalgar Napoleon gave up the idea of invading England and turned toward Spain which he invaded on 17 November 1807. The initial action of the Peninsular War culminated in the retreat of the British army from Corunna in 1809 followed by the return to Spain of British armies under Wellington. Napoleon was defeated and exiled after the retreat from Moscow in 1812. When Napoleon escaped from Elba in 1815 there followed 100 days of war until he was finally defeated at Waterloo and exiled to St Helena. In Ireland there was frenzied activity as recounted in the newspapers. On 19-11-1807 volunteers of English regiments joined the 81st at Waterford. Volunteers from the militia reached Limerick from Galway en route to Cork to join the 27th and 67th regiments. On 22 November the Knight of Kerry, Maurice Fitzgerald passed through Limerick en route to Ballinasloe to join the Royal Co Limerick Regiment. Colonel Oaen MP in Limerick travelled to Mullingar to join his regiment. The 9th foot from Fermoy passed through Clonmel en route to Dublin. The 34th foot arrived at Cork harbour en route to Bandon. The flood of volunteers from the South Cork militia exceeded the quota for the designated regiments and another 25 regiments were designated to take volunteers transferring from that militia to the line regiments. The Salisbury transport commanded by Purdie with 200 soldiers was lost on the east coast of England and the Providence transport commanded by Blaber was wrecked on Long Sands people saved. An extract of letter from a midshipman sailor on board HMS Monarch described a fleet of nine warships with 5000 soldiers embarked from Causland Bay for the Mediterranean. At the same time a fleet brought troops from Denmark and they were disperses in garrisons along the south east coast of England. It is worth understanding the role of the militia in the army of the time. Militia regiments did not serve overseas except with rare exceptions and then on garrison duty. In 1798 the Mayo militia was engaged in fighting against the French troops who landed at Kilalla. Subsequent to the 1807 draft lost in Dublin bay an 1808 recruiting party for the 77th regiment obtained 50 recruits from north and south Mayo militias. English militia regiments were also fertile recruiting grounds. The Mayo militia were mostly based at the Curragh camp. The North Mayo militia merged with the South Mayo militia to form the third battalion of Connaught rangers in 1881. The regiment they joined was originally the Minorca regiment raised in 1798 at Minorca from prisoners of Swiss regiments in Spanish service. In 1802 they became known as the Queens Own German Regiment after Queen Charlotte. By 1805 they acquired the title of 97th regiment. They ceased to be regarded as a foreign corps in 1810 because they had become diluted by British recruits typical of the Mayo militia volunteers lost on the Rochdale. After the Peninsular and Napoleonic wars the regiment was disbanded at Limerick in 1818. In 1824 a new 97th regiment was formed and given their battle honours. The loss of two troopships near Dublin was a minor incident in the Peninsular phase of a great European war. Many more lives were lost before the troops reached Spain and losses in Spain exceeded half the force. The regiment fought Napoleon at Vimero. On 19 November1807 several troopships left the Pigeon House Harbour at Ringsend near Dublin with troops bound for Liverpool. The ships themselves were quite small, the Prince of Wales being a 20 year old Chester built sloop of 103 tons and a draught of 11 feet. 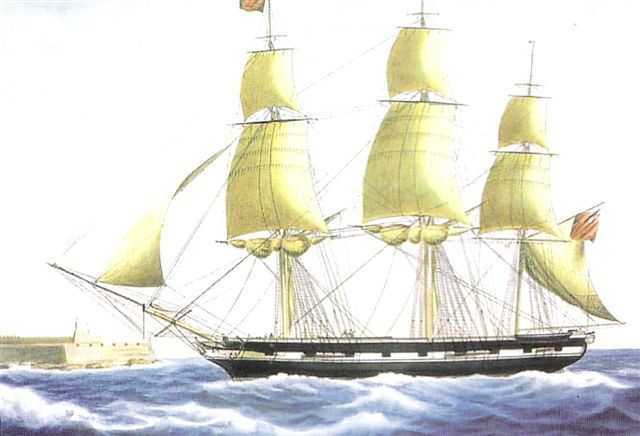 The Rochdale was a slightly larger 10 year old brig of 135 tons with a 10 foot draught. The Prince of Wales, packet of Parkgate, captained by Jones had the 97th regiment aboard along with recruits from the South Cork and South Mayo regiments of militia. The next day the ships were seen working about the Bay and trying to stand into the Harbour. There was a very heavy fall of sleet and snow. Towards evening gun signals were fired indicating distress. Captain Jones who escaped from the Prince of Wales described the events thus: Having arrived opposite Bray Head the sea began to swell and the wind blow a hurricane. He threw all his anchors out but the ship dragged them all along impetuously. She drove without a rag of sail towards Dunleary Point and he expected to be dashed against the rocks there. He repeatedly told the officers of the danger before she struck about 6 or 7 in the evening. The accounts describe the ships getting six leagues off shore when the storm forced them back. The anchors were cast out at Man O War roads between Dalkey and Dun Laoghaire. The master of the Prince of Wales Robert Jones, nine seamen, two soldiers, two sailors, passengers, two women and children, took to the long boat when the vessel struck off Sir John Lees house at Blackrock. The boat party got safely to Mr St George’s house at Blackrock. The losses from Prince of Wales were Lieutenant Maclean of the 18th foot, with 61 volunteers from the South Mayo militia, Lieutenant Foley 58th foot, Captain Gregory and Lieutenant Kilkelly of the 32nd foot, Sergeant of the 25th regiment, Ensign Beaven of the 10th foot, Ensign Baggot of 85th foot Ensign Kidd of 85th foot, Lieut. Wasey of 2nd foot, Lieutenant Brown of 62 foot. Each officer had a party of soldiers and servants. A total 120 officers and men were lost. There was a report that the hatches were battened down but Mr Moss, the coroner deputed a party of four gentlemen to visit the wreck site and ascertained that there was no substance in the story. An immense amount of baggage was washed ashore and a large party of troops were put on guard. Looters gathered as was usual at the time and one from Dun Laoghaire was drowned. All the weekend was spent in collecting the bodies for burial at Monkstown and Merrion cemeteries. 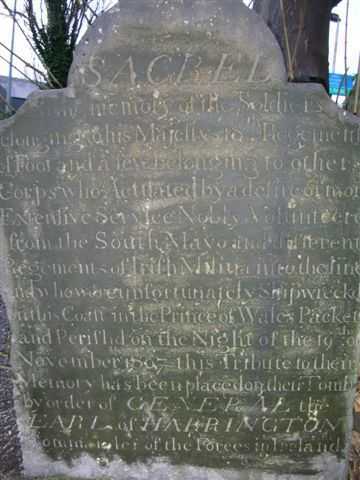 A memorial was also placed at St Begnet’s graveyard, Dalkey. The account is somewhat confusing as the numbers aboard do not seem to include crew and the detail is predominantly regarding the military aboard. Captain Jones of the Prince of Wales was subsequently imprisoned awaiting trial according to report of November 30th. No account of the trial was found. The Rochdale (Captain Hodgson) was wrecked on the rocks at the Martello tower at Seapoint. It was observed that no pilot could have steered her alongside at the Martello as neatly as she lay. The Rochdale had aboard the staff of the 97th regiment. There were no survivors from the Rochdale, two hundred and sixty five perished including major Gormoran, lieutenants Long and Power, ensign Way, 8 sergeants, 9 corporals, 173 rank and file, 44 women, and 29 children.. The same night a collier was lost with all hands at the South Bull, A trader belonging to a Dublin broker was also lost. The Liverpool Packet was feared lost as a vessel fitting her description was seen bottom up off Bray The Lark another transport from Dublin reached Holyhead in safety. Sacred to the memory of the soldiers belonging to His Majesty’s 18th regiment of foot and a few belonging to other corps who actuated by desire of more extensive service nobly volunteered from the South Mayo and different regiments of the Irish Militia into the line and who were unfortunately shipwrecked on this coast in the Prince of Wales packet and perished on the night of 19 November 1807 this tribute to their memory was erected on the tomb by order of General the Earl of Harington commander of the forces in Ireland. A headstone is in the graveyard beside the Tara towers hotel in Booterstown. Where 300 are reputed to be buried reads. Sacred to the memory of the non commissioned officers and private soldiers belonging to his majesty’s 97th regiment of foot who were shipwrecked on this coast in the Rochdale transport and perished on the night of 19 November 1807. In commemoration of the distinguished gallantry of this corps and the important services they had rendered to their king and country this record has been placed on their tomb by order General the Earl of Harington commander of the forces in Ireland. Beneath this stone lies the mortal remains of one of the bravest and best men of the 97th regiment Chas Gormoran who perished on board the Rochdale Nov 20th 1807 aged 42 years. The stone was erected by his most unfortunate widow. Also her nephew ensign Robert Way of the same regiment aged 19 years. The Freeman’s journal 27-11-1807 published the abstract of the proceedings on an inquest held on the bodies of the 37 passengers who perished on Thursday the 18th inst. Henry Lynch deposed before the coroner and respectable jury that some of the South Mayo militia volunteered into the 18th and 97th regiments of the line. Robert Jones of Liverpool master of the Prince of Wales packet deposed that he sailed from the harbour of Dublin about 2 p.m. Wednesday 1 November. The crew consisted of 8 sailors, a boy, a steward and himself. As passengers there were 9 military officers and a number of soldiers. On Thursday morning about 6.30 the wind freshened and about three sleet and snow became thick. About four, witness found it necessary to tack about and stood towards Howth – the vessel after having been tossed dragged her anchors, about 7 o’clock she stuck fast in seven feet water, and turned on her side. The waters ran high over her; the boat having been shaken out of the vessel such men on her deck that could accomplish it, jumped into her. There were seventeen in all. The Freeman’s Journal of 30 November reported that Robert Jones and his crew had been imprisoned at Newgate pending trial but there was no further report. An advertisement appeared on November 30th 1807 thus: Late melancholy shipwreck The regimental plate of the 97th regiment having been on board the Rochdale which under such melancholy circumstances was wrecked on the night of the 19th inst. In Dublin bay, and there being reason to suppose that a part, if not the whole of the said plate has been purloined from the wreck of the said vessel. All persons to whom the same or any part thereof may be offered for sale are cautioned against countenancing such unfeeling and unworthy pillage, by purchasing any part of it and are required to preserve it for the owners. Some of the above mess furniture offered for sale, has been already stopped – and it is hoped that this conscientious and unscrupulous conduct will be imitated by pawn brokers, jewellers and others to whom any part of the plate may be brought. It is hoped for the honour of humanity, that no decent or reflecting person will avail themselves of the calamity that has occurred or compromise every generous feeling so far, as for a contemptible advantage to encourage the plunder of the unfortunate. Persons of humble condition may have got possession of some of the mess plate by fair accident, and without any criminality; if they will bring any plate that they may have acquired to Messrs. Arnitt and Bourough agents to the 97th regiment, no 1 Kildare St., they may rely on being handsomely rewarded for their trouble. The whole of the regimental plate of the 97th or Queens Germans was unfortunately lost on the Rochdale. Several articles of this plate have been put up and are now offering for sale. This gallant regiment the misfortunes of which have been at once sudden and signal ranks among the very first regiments in the British army for discipline and bravery. In all the Egyptian campaign it was distinguished for courage and fidelity in the every instance for which it was engaged and fought in all the severe actions so highly regarded in the annals of the British army. The Freeman’s Journal called for the Ballast Office committee to examine all passage vessels and determine how completely masters and owners made the vessels safe by having a crew proportionate to the needs. But by the 26th the Freemans Journal published a retraction. “It was lately mentioned that there was no agent of transports appointed for Dublin. A naval officer of ability fills that position whose exercises on the late melancholy occasion do him great credit. Several packets had been lost but the HM Packet boats were observed to have operated for 117 years without loss. The allegation that the victims of the Prince of Wales had been confined below while the crew escaped was disproved. A pamphlet entitled “The Ensanguined strand of Merrion” was published anonymously setting out a case for the construction of a canal from the existing old Dunleary harbour to Ringsend to connect with the Grand Canal harbour avoiding the need to cross the sandbanks barring the port entrance. The pamphlet was subtitled “stuffing for the pillow of those who could have prevented the recent calamity in the bay of Dublin”. There were other proposals for a harbour at Ireland’s Eye and at Dalkey Island. A Dublin shipbroker, Toucher commenced a campaign in November 1807 to have an asylum harbour constructed at Dun Laoghaire. His letters do not mention the two shipwrecks specifically but the strands at Sandymount and Merrion had as many as ten shipwrecks simultaneously in severe easterly gales. There is no doubt that the loss of the Prince of Wales and Rochdale gave added impetus to plans for Dun Laoghaire harbour which were already in train. The Act of Union in 1800 required that Irish MPs could travel to Westminster easily. Work was in progress on Holyhead harbour, the Menai Bridge and Telford’s turnpike road. All were part of a multi project route to London from Dublin. The Dublin Ballast Board had been in charge of Dublin port from 1708 and they constructed the South Wall in 1768. The big issue was the shallow approach to Dublin over sandbanks. These matters had been addressed in the report of Captain Bligh on Dublin Harbour. 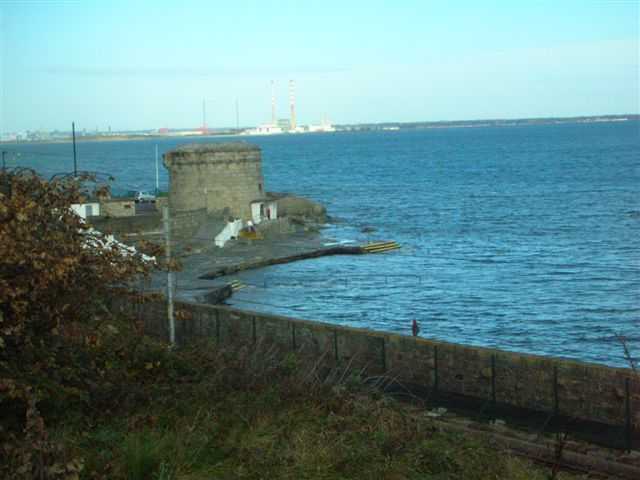 He had recommended building the North Wall to augment the effect of the South Wall and use the current of the falling tide to wash away the sandbanks at the mouth of the Liffey. Firstly a packet harbour was built at Howth and King George landed there in 1821 but introduction of steam packets from 1819 required deeper water than was available. Howth’s rocky bottom precluded any dredging. Planning commenced for the Dun Laoghaire harbour in 1815 with the first stone laid in 1817 and so King George IV was able to sail from the partially completed works on his return trip stopping to name the Harbour “Kingstown”. The railway arrived in 1832 and there was no further talk of a ship canal The Prince of Wales and Rochdale were not the only troopships wrecked on the Irish coast. The Impatiente, part of the 1797 Wolfe Tone expedition to Bantry was wrecked with the loss of 300 aboard at Mizen Head. In January 1816 after Waterloo the Lord Melville, Boadecia and Seahorse were lost at Waterford and Cork and 650 troops and families perished. The Leinster, torpedoed off the Kish in 1918 was a troopship and some 350 soldiers were lost among the 500 victims. Earlier still in 1775 the Rockingham sank in Rennies bay with 150 troops bound for the American War of Independence. Similarly the Britannia struck Inisboffin in 1780 and up to 100 soldiers died. 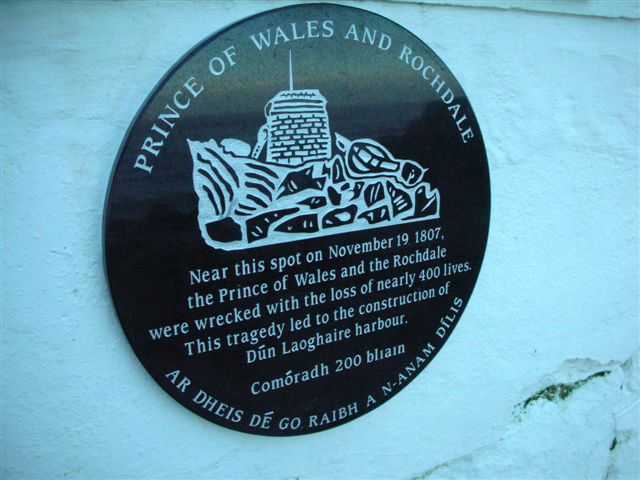 The wreck of the Rochdale was sold in May 1808 to a Dun Laoghaire Man for 36 guineas. I acknowledge the intrepid guide and historian Cormac Lowth who led a fascinating tour of the foreshore at Blackrock one winter afternoon last year. The help of the National library and Dublin Corporation Pearse St Library was, as always, vital. The Ensanguined Strand of Merrion. An anonymous pamphlet published 1807 held at the National Library. History Of Dun Laoghaire Harbour, De Courcy De Burca Books, 2001, ISBN 0 946130 27 2. Commander Skinner, Peter Scott Roberts, Holyhead Maritime Museum 2006. Shipwrecks of the Irish Coast vols. 1-3, Edward J Bourke.